← Richard Dawkins & the humanist’s dilemma: When faced with Islamic State does “moderate” religious discrimination really matter? What happens when a prince walks away from his kingdom? I love the symbolism and and dream like metaphors of fairy stories. So a “real life” one is all the more intriguing. 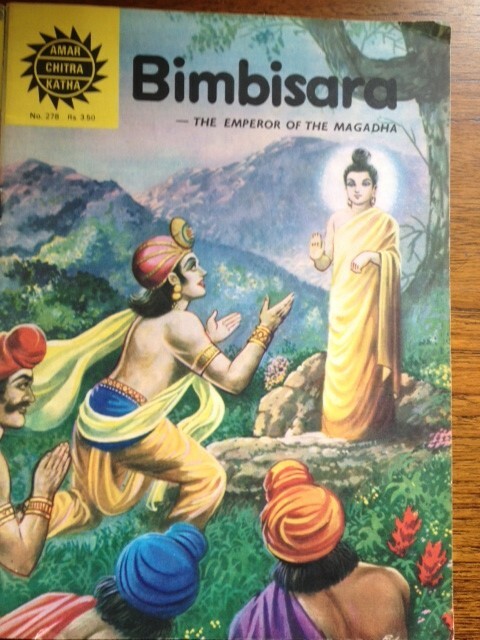 I’d been fascinated with the story of Siddartha, the prince who became the Buddha. Especially as the faith he founded could be seen not to be a faith. Was it about God or not? Why did it lose its power in India; the country of its birth? And what to make of all those images of him? In the early years Buddha was represented by symbols — a foot print, a wheel, or the tree under which he attained enlightenment. The statues could seem to be idols to a saint, or even a god, especially when covered with gold. So with producer Anthony Denselow, with whom I’d made the Something Understood about Transience, I decided it was time to look at the man behind the figure. Siddhartha was a real person; born in what’s now Nepal the sixth century BC. Hindu astrologers predicted he would be a great emperor or a great sage. His father fearing the latter, ensured he was raised as a master of martial arts, diplomacy and languages, and kept away from any sign of the suffering in the world outside. The pali canon of texts from Sri Lanka, about his life and acts weren’t written down till about two hundred years after he died. We explore the story of his life which I view as a fairy tale in reverse. For this handsome prince, happily married with a son and raised to rule, the happy ending is only a beginning of a journey. He may have been reconciled eventually to the wife and child he abandoned but the idea that you could walk out on worldly life including family is deeply troubling. We all think we know the Buddha. Those serene smiling images we see in holiday brochures about Thai and Cambodian temples. Or decorate our homes with. This is the one (above) in my living room. I bought it a few years ago from an Indian market at the Royal Festival Hall on impulse having previously always slightly sneered at those who used his image as home decor. And it was because of that smile. The vendor told me she sourced it in Thailand where the sculptors say they meditate before carving to try to capture the visual idea of nirvana or enlightenment. Beat writer Jack Kerouac wrote a fascinating book about the Buddha, an extract of which is in the programme. We look at the appeal in the West and how the message of Buddhism was adopted and perhaps distorted in the hippie era. I spent the summer driving down the same California coast as Kerouac via Big Sur and was struck by how many Buddhist temples, churches and images I came across from San Francisco to Los Angeles. In fact what should I encounter in the Warner Brothers Studio tour props lot than this Buddha, as part of a “ready to rent” Eastern set. In the rather naff millionaires’ playground town of Carmel, full of petrolheads for a luxury classic car show, there was even a copy of the Buddha’s Teachings alongside the Gideon Bible in the hideous ripoff motel. It’s not surprising Buddhism in the West can sometimes seem like a lifestyle choice for people rich enough not to have to worry about money. 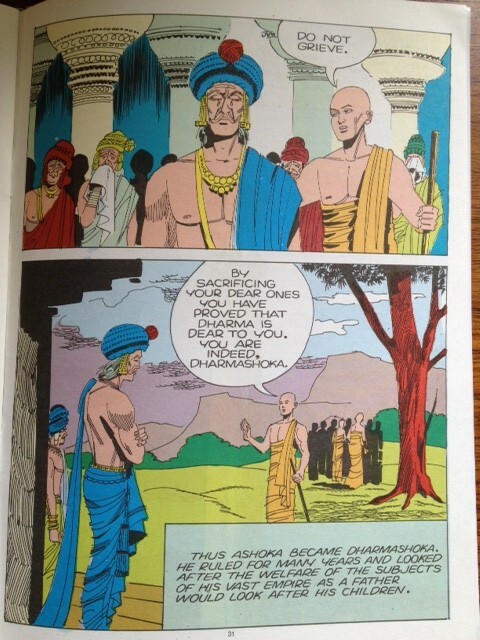 Siddhartha became a great teacher. But Ashoka, who lived 200 years later, became a great emperor; uniting Northern India for the first time. His wheel adorns the Indian flag today and it’s incredible to think that the message of the Buddha and the creation of a world religion might have been wiped out altogether but for him. Ashoka went on to establish the world’s first welfare state building dispensaries and houses of rest. But I was again left troubled reading how his children all asked to leave to become monks and nuns. He was left alone — Dharmashoka – honoured for his devotion to duty — with no heir. How to live as a king with Buddhism? And how to live with Buddhism in this consumer age? There are some interesting answers to that provided by some of our readings. And I’m especially delighted that the marvellously talented actors David Yip and Davina Perera agreed to do the readings. I hope you enjoy it and that it might get you to view the next Buddha statue you see in a fresh way. Several listeners have asked about the final poem not listed in readings on the programme page. It’s by the 13th century Zen monk Daikaku. exist in your own mind or exist outside it. where thinking goes no further and distinctions vanish. Something Understood: The Prince Who Walked Out of His Fairytale was on Radio 4 on Sunday August 31st and on i-player at this link for 7 days afterwards. All photos copyright Samira Ahmed. No reuse without permission. Comic covers/photos from my collection of ACK comics. This entry was posted in Books, History, Music, Religion, Travel and tagged Ashoka, BBC, Buddha, David Yip, Herman Hesse, Hinduism, Hollywood, India, Jack Kerouac, literature, Prince Siddartha, Something Understood. Bookmark the permalink. 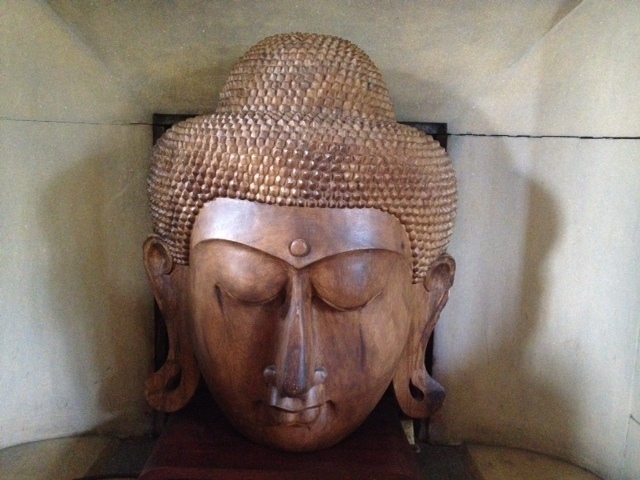 It interests me how the Buddha has become a popular decorative motif. And also how his original teachings have been harnessed in todays worry-weary world – mindfulness is everywhere, no? The idea of shunning home and family to become sannyasin is unfamilar in the West but a valid second half of life choice in other cultures. The fact of having ‘everything’, relinquishing attachment and seeking a deeper and more permanent identity and ground of being is the template for the spiritual seeker. Contrast to consumer culture – you must buy more and it is never enough. Absolutely, Jennifer. did an earlier programme on Wilderness Years when I discussed the Indian idea of retreat in later life with Jay Lakhani of the Hindu Academic. It’s interesting how it remains a fundamental cultural divide. Ooh, I wonder if I can find that programme to listen to. But we kind of face this in secular western culture – the mid-life crisis is understood by many psychologists as a turning point where one’s deeper, internal needs demand to be addressed. Jung’s theory of individuation speaks to this, it is the calling of the soul. And Campbell’s hero’s journey. So perhaps universal to the human psyche? I suppose we do have genuine cultural ignorance that makes it more difficult for some to understand what is happening, if it is even taken seriously at all. As it stands now we are condemned to be economically active well into our later years, though religious pilgrimages are acceptable I think increasingly in the modern workplace, but perhaps when structured to a specific outcome, which is the opposite of the Buddha’s experience, the pathless path. Maybe we need to invent something new, like an adult gap year, but to go inwards, not outwards? Thanks for the conversation.